Mechanical systems Devices which can be considered to be motion converters in that they transform motion from one form to some other required form. 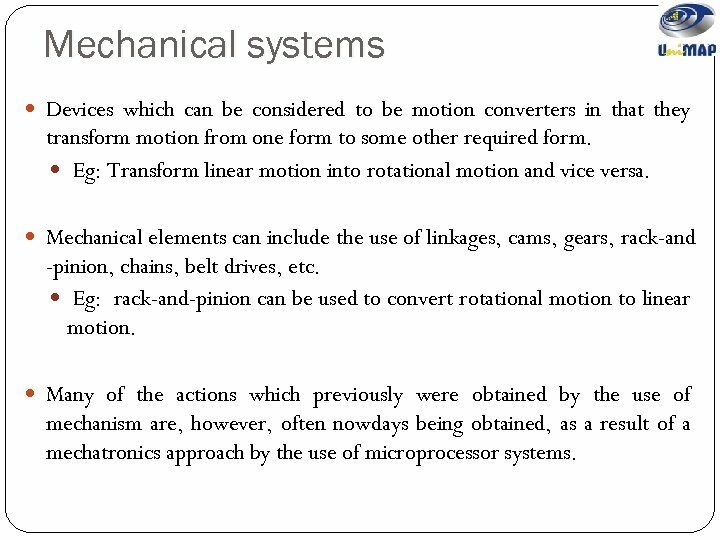 Eg: Transform linear motion into rotational motion and vice versa. Mechanical elements can include the use of linkages, cams, gears, rack-and -pinion, chains, belt drives, etc. 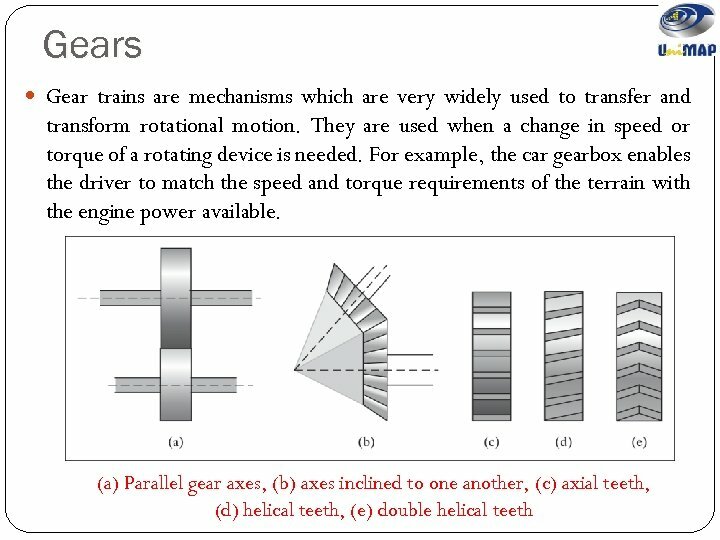 Eg: rack-and-pinion can be used to convert rotational motion to linear motion. Many of the actions which previously were obtained by the use of mechanism are, however, often nowdays being obtained, as a result of a mechatronics approach by the use of microprocessor systems. 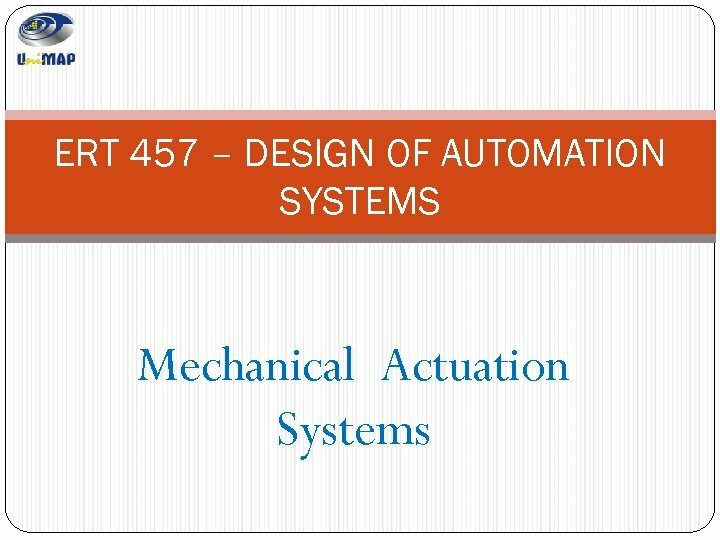 Mechanical systems Mechanisms still, however, have a role in mechatronics systems. For example, the mechatronics system in use in an automatic camera for adjusting the aperture for correct exposures involves a mechanism for adjusting the size of diaphragm. 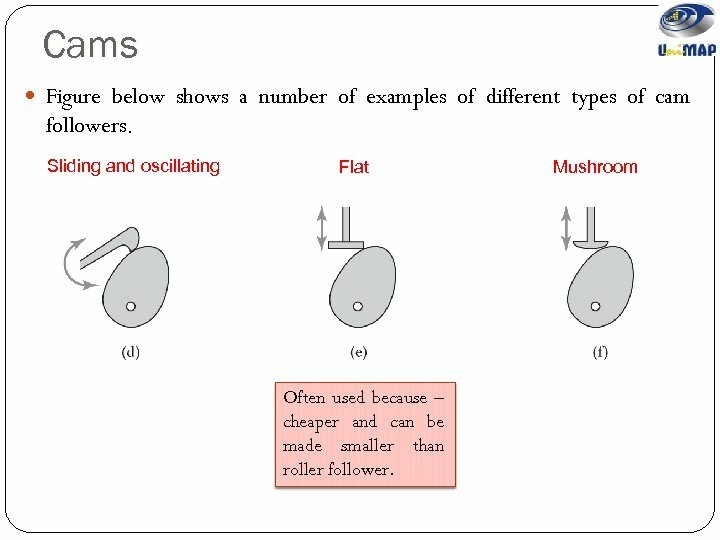 Others function: Force amplification – given by levers. 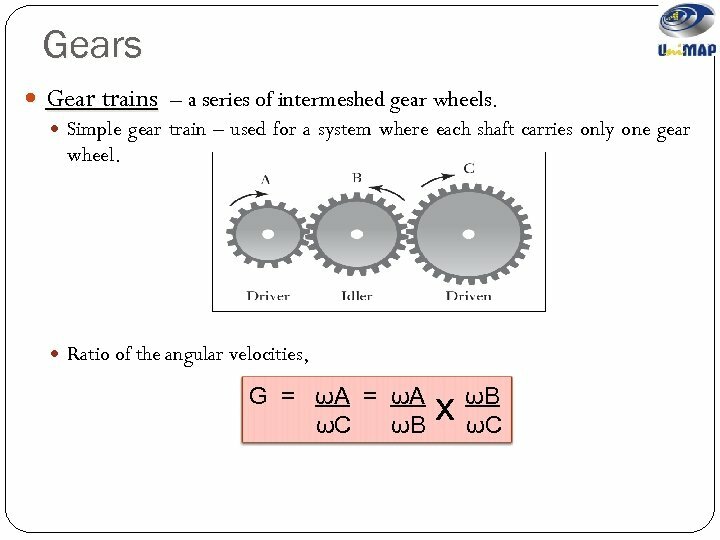 Change of speed – given by gears. 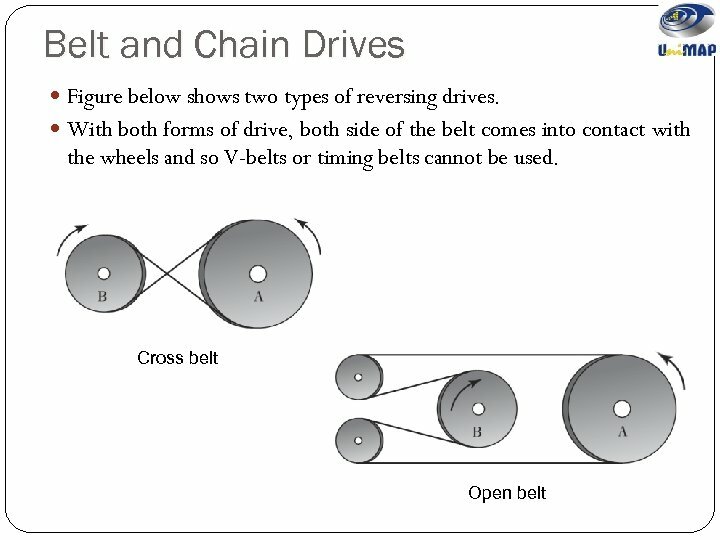 Transfer of rotation about one axis to rotation about another – timing belt. The term kinematics is used for the study of motion without regard to forces. 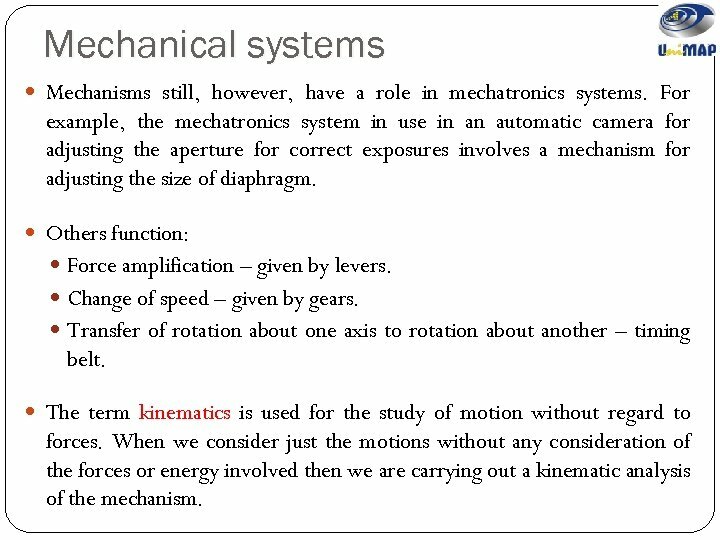 When we consider just the motions without any consideration of the forces or energy involved then we are carrying out a kinematic analysis of the mechanism. 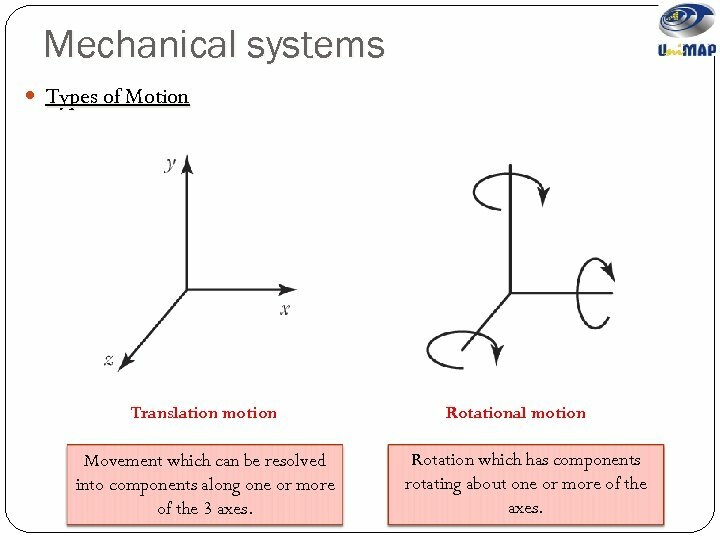 Mechanical systems Types of Motion Translation motion Movement which can be resolved into components along one or more of the 3 axes. 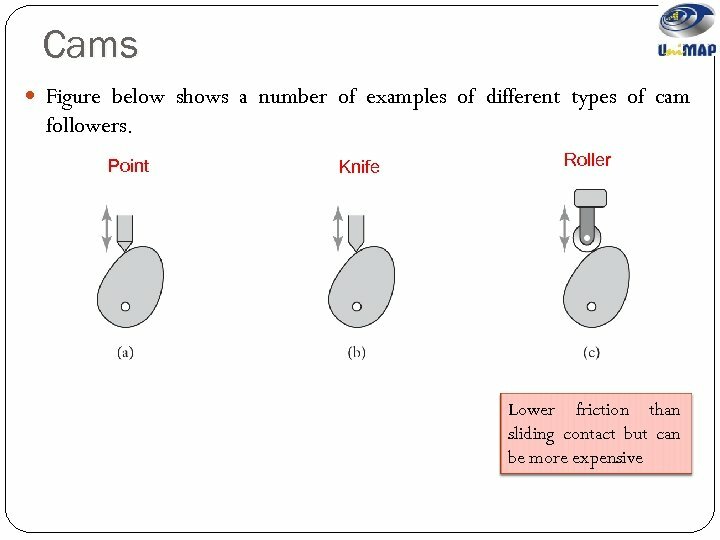 Rotational motion Rotation which has components rotating about one or more of the axes. Mechanical systems Freedom and Constraints An importance aspect in the design of mechanical elements is the orientation and arrangement of the elements and parts. A body that is free in space can move in three, independent, mutually perpendicular directions and rotate in three ways about those directions. It is said to have six degree of freedom. The number of degree of freedom is the number of components of motion that are required in order to generate the motion. 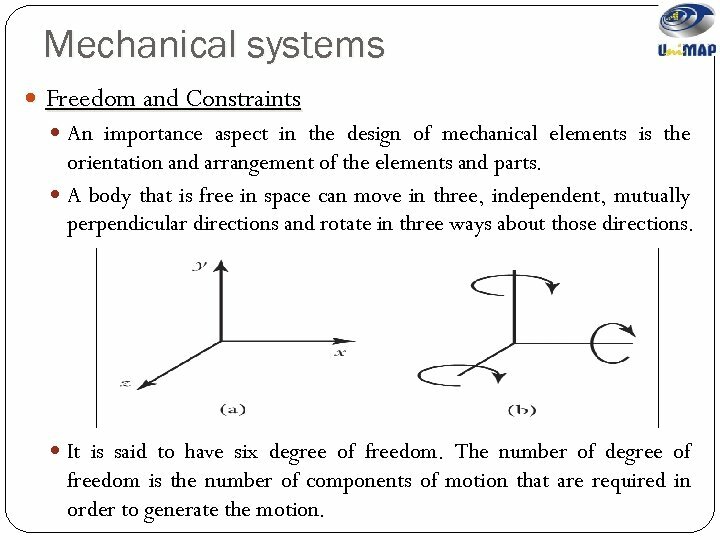 Mechanical systems Freedom and Constraints Figure (a) shows a joint with just this one translational degree of freedom. 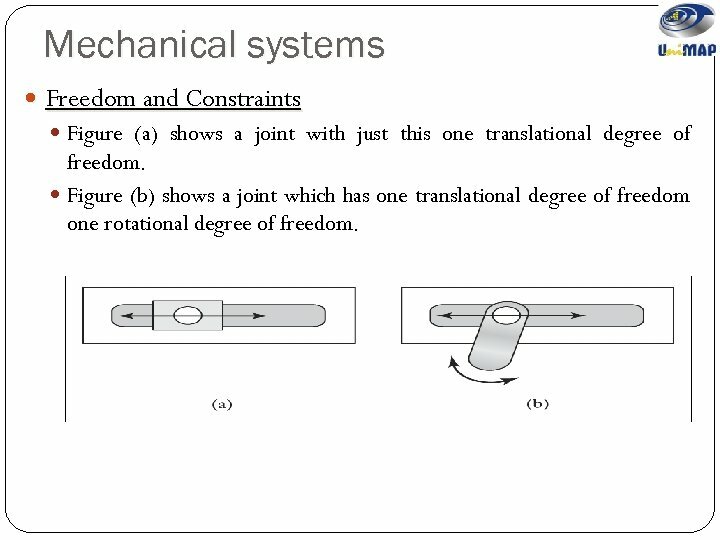 Figure (b) shows a joint which has one translational degree of freedom one rotational degree of freedom. 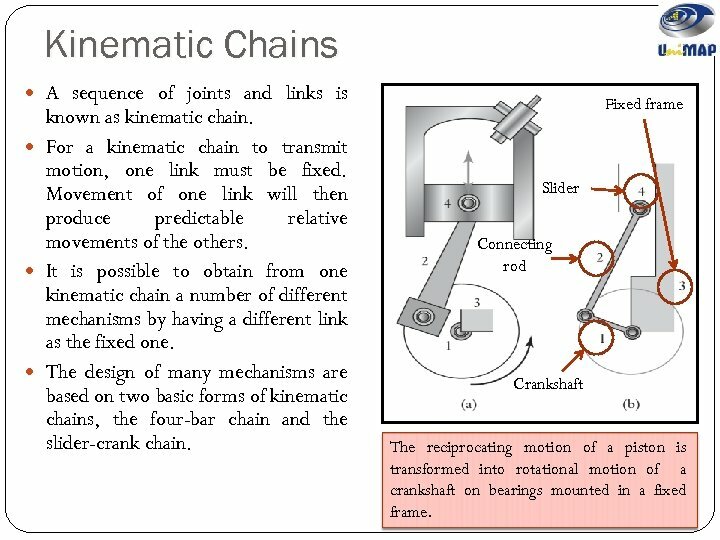 Kinematic Chains A sequence of joints and links is known as kinematic chain. 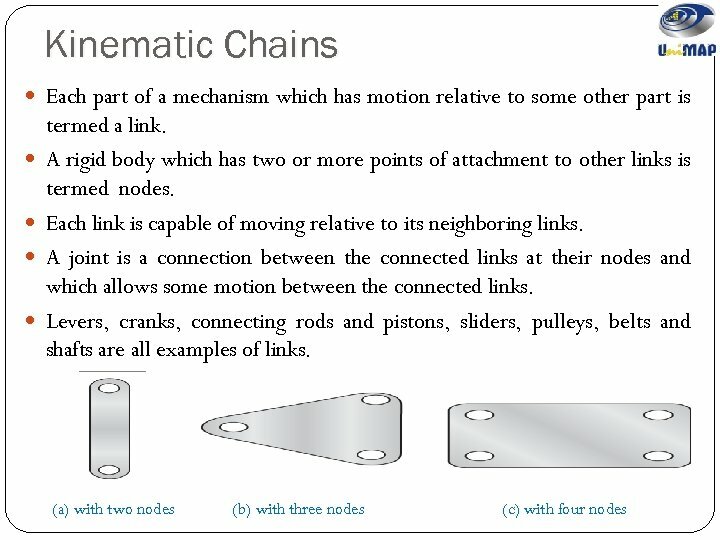 For a kinematic chain to transmit motion, one link must be fixed. Movement of one link will then produce predictable relative movements of the others. 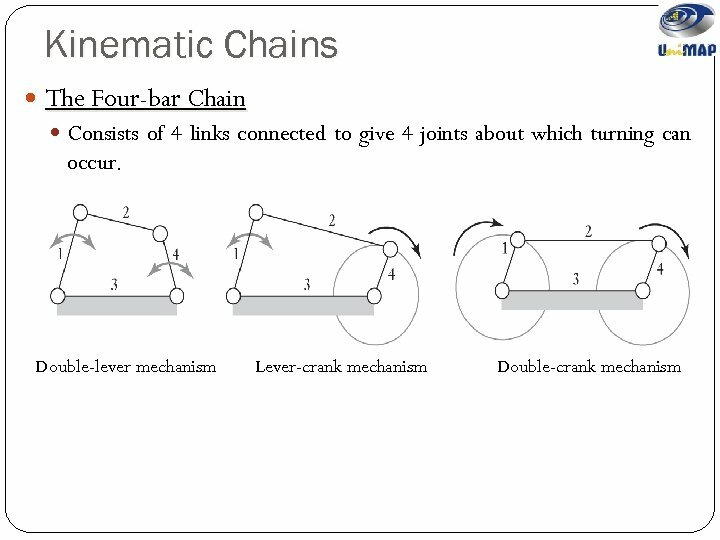 It is possible to obtain from one kinematic chain a number of different mechanisms by having a different link as the fixed one. 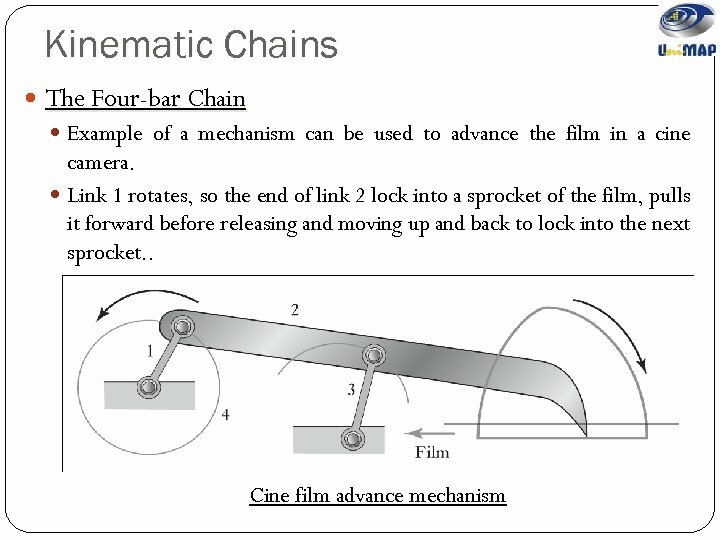 The design of many mechanisms are based on two basic forms of kinematic chains, the four-bar chain and the slider-crank chain. Fixed frame Slider Connecting rod Crankshaft The reciprocating motion of a piston is transformed into rotational motion of a crankshaft on bearings mounted in a fixed frame. 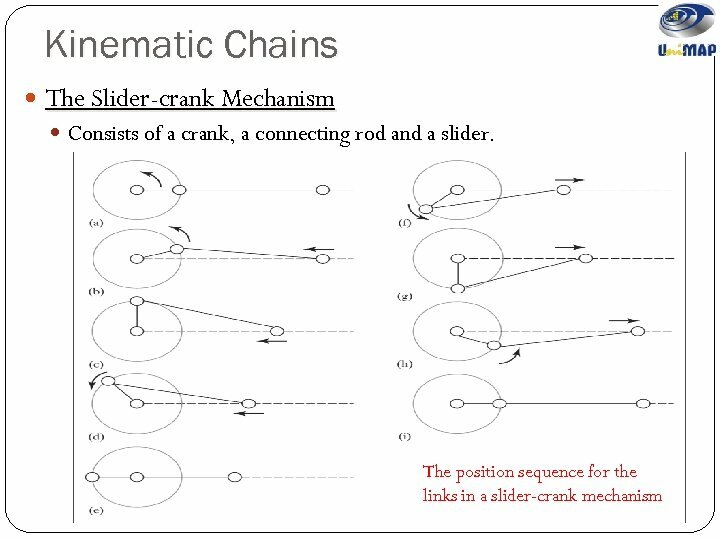 Kinematic Chains The Four-bar Chain Some linkages may have toggle positions. These are positions where the linkage will not react to any input from one of its links. 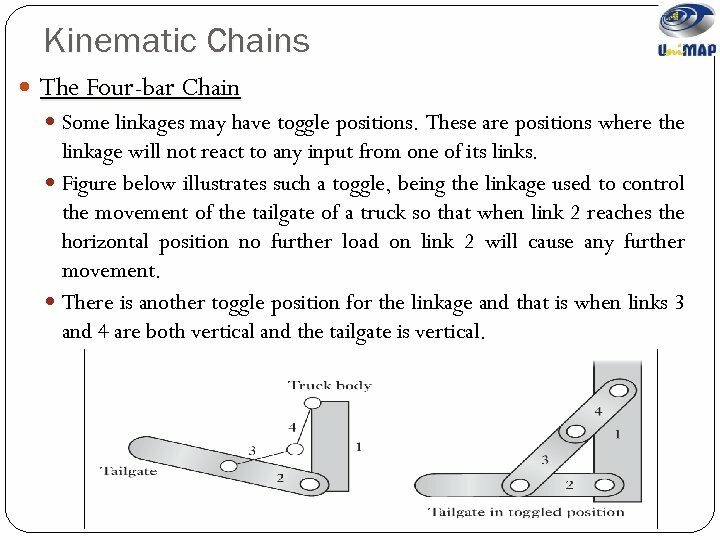 Figure below illustrates such a toggle, being the linkage used to control the movement of the tailgate of a truck so that when link 2 reaches the horizontal position no further load on link 2 will cause any further movement. There is another toggle position for the linkage and that is when links 3 and 4 are both vertical and the tailgate is vertical. 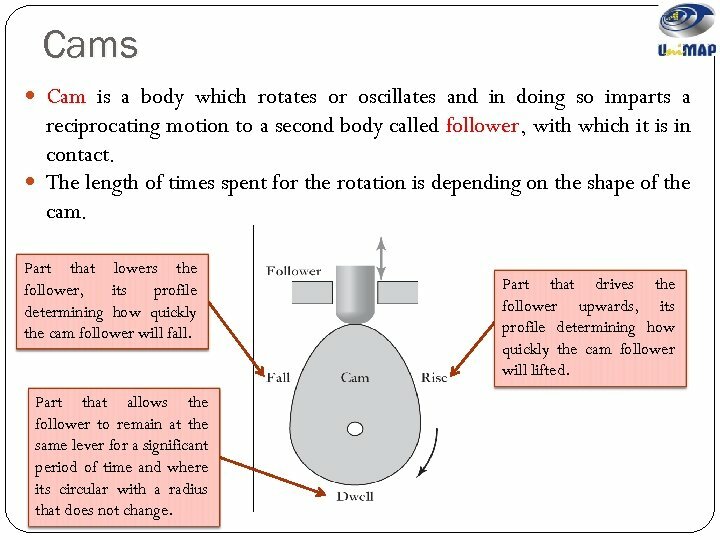 Cams Cam is a body which rotates or oscillates and in doing so imparts a reciprocating motion to a second body called follower, with which it is in contact. 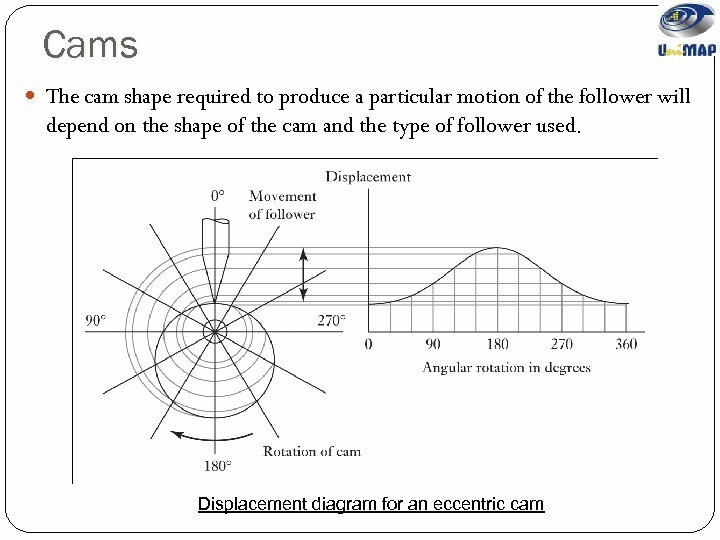 The length of times spent for the rotation is depending on the shape of the cam. 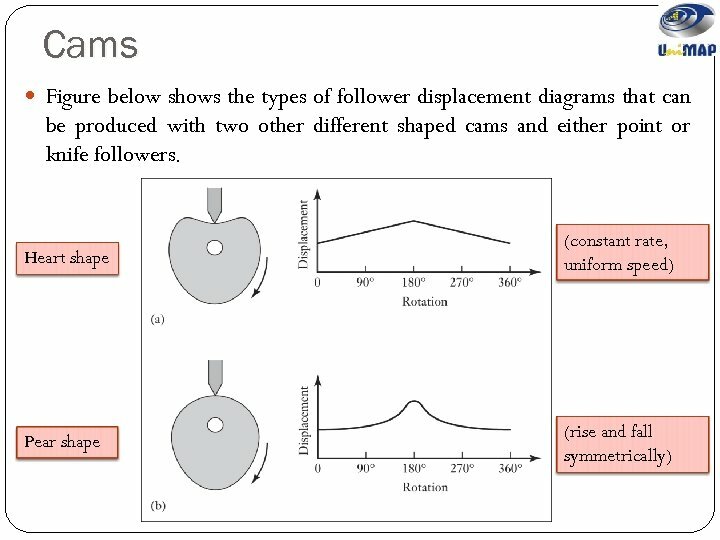 Part that lowers the follower, its profile determining how quickly the cam follower will fall. Part that allows the follower to remain at the same lever for a significant period of time and where its circular with a radius that does not change. Part that drives the follower upwards, its profile determining how quickly the cam follower will lifted. 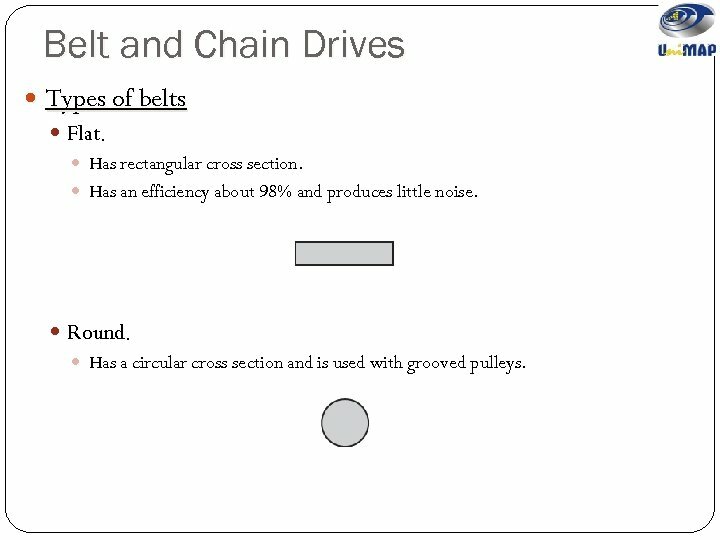 Belt and Chain Drives Pair of rolling cylinders with the motion of one cylinder being transferred to the other by a belt. 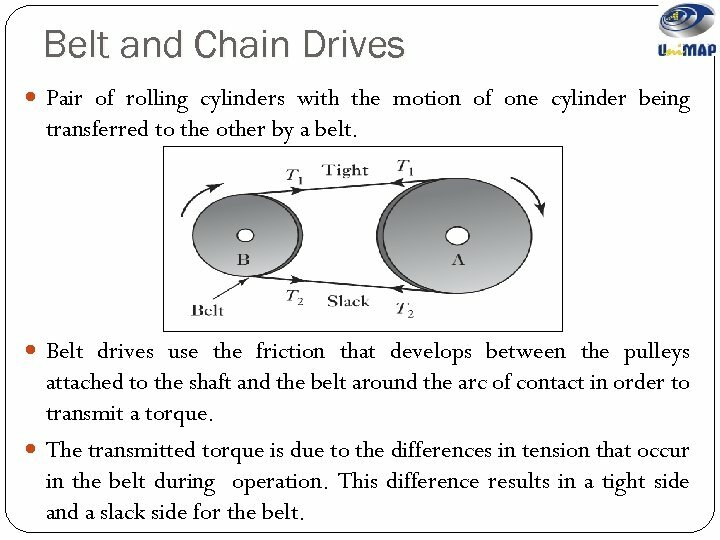 Belt drives use the friction that develops between the pulleys attached to the shaft and the belt around the arc of contact in order to transmit a torque. 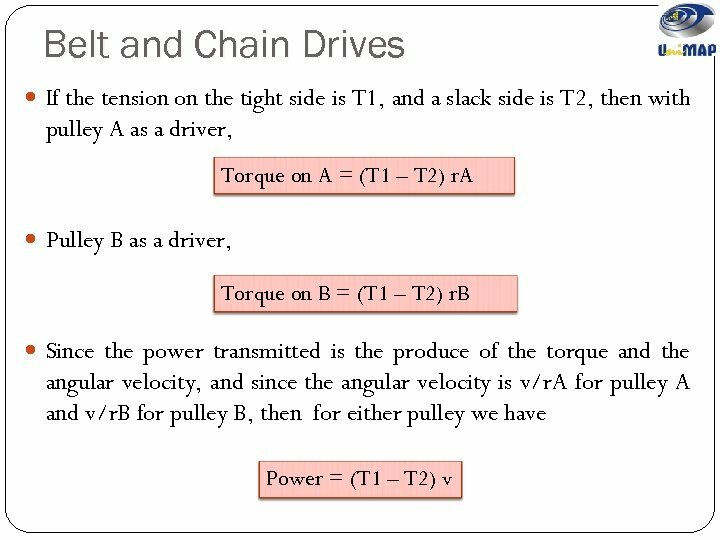 The transmitted torque is due to the differences in tension that occur in the belt during operation. This difference results in a tight side and a slack side for the belt. 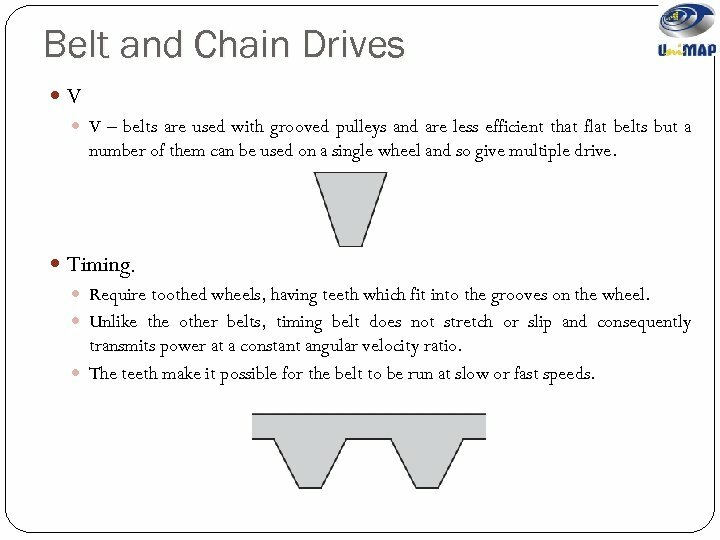 Belt and Chain Drives As a method of transmitting power between two shafts, belt drives have the advantage that the length of the belt can easily be adjusted to suit a wide range of shaft to shaft distance and the system is automatically protected against overload because slipping occurs if the loading exceeds the maximum tension that can be sustained by frictional forces. 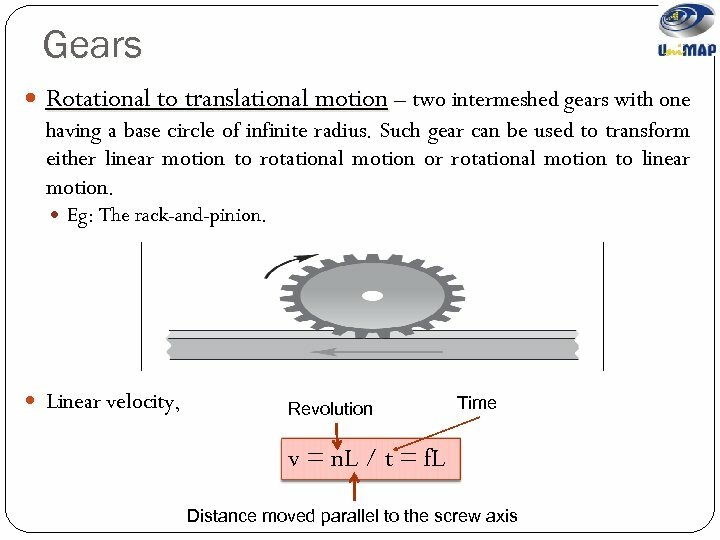 If the distance between shafts is large, a belt drive is more suitable than gears, but over small distances gears are to be preferred. 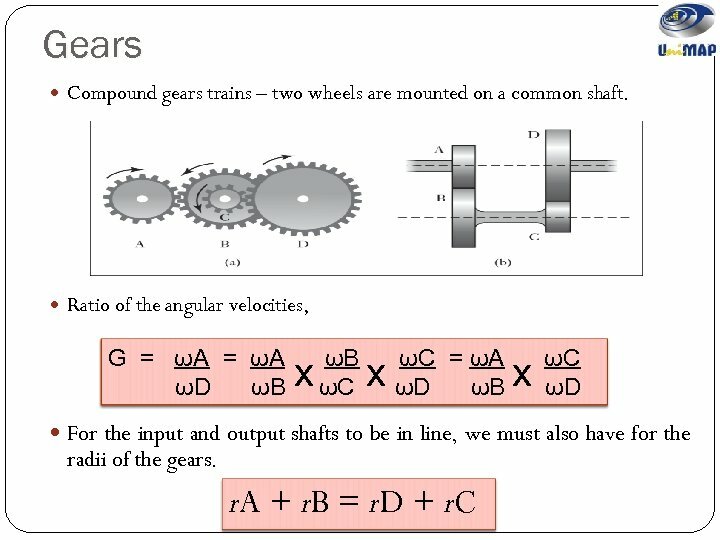 Different size pulleys can be used to give a gearing effect. 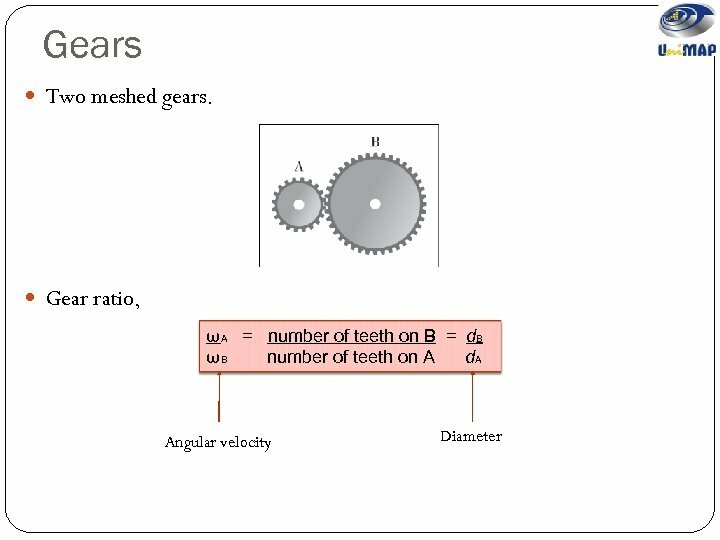 However, the gear ratio is limited to about 3 because of the need to maintain an adequate arc of contact between the belt and pulleys. 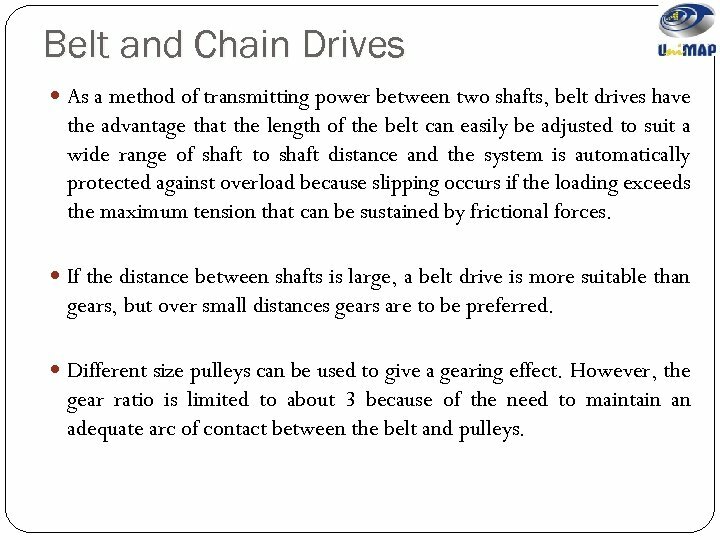 Belt and Chain Drives Types of belts Flat. Has rectangular cross section. Has an efficiency about 98% and produces little noise. Round. Has a circular cross section and is used with grooved pulleys. Belt and Chain Drives V V – belts are used with grooved pulleys and are less efficient that flat belts but a number of them can be used on a single wheel and so give multiple drive. Timing. Require toothed wheels, having teeth which fit into the grooves on the wheel. Unlike the other belts, timing belt does not stretch or slip and consequently transmits power at a constant angular velocity ratio. The teeth make it possible for the belt to be run at slow or fast speeds. 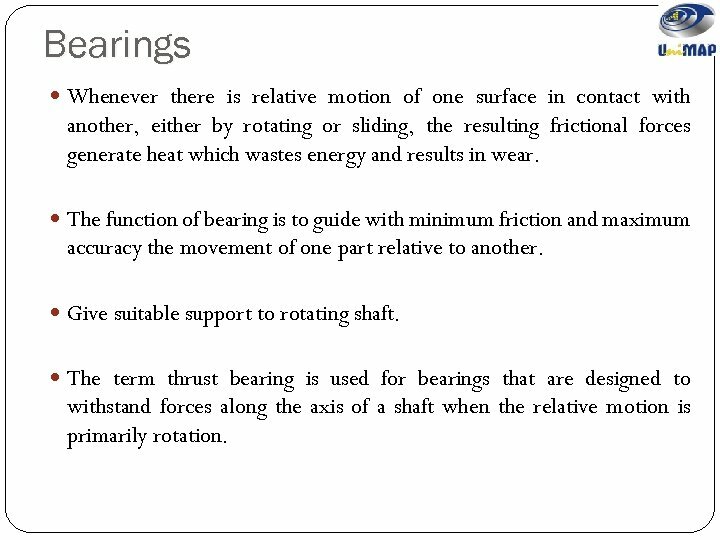 Bearings Whenever there is relative motion of one surface in contact with another, either by rotating or sliding, the resulting frictional forces generate heat which wastes energy and results in wear. 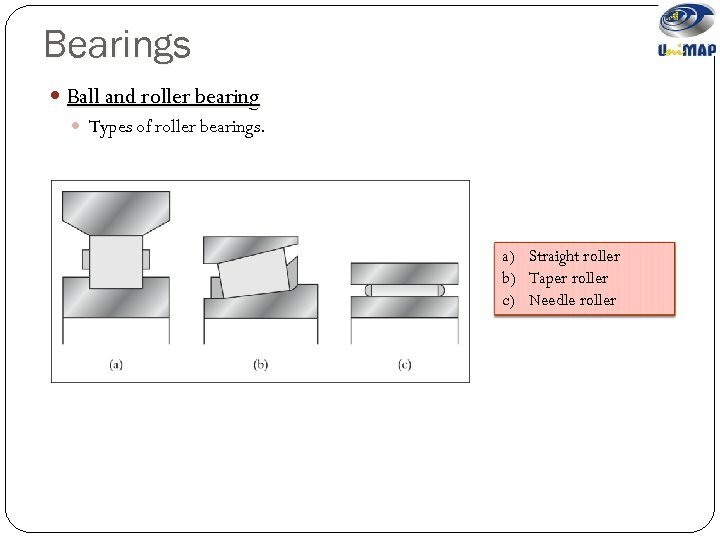 The function of bearing is to guide with minimum friction and maximum accuracy the movement of one part relative to another. 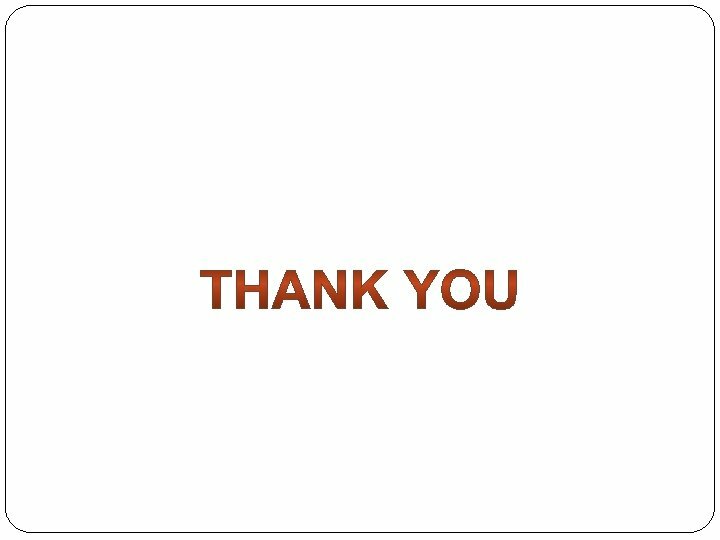 Give suitable support to rotating shaft. 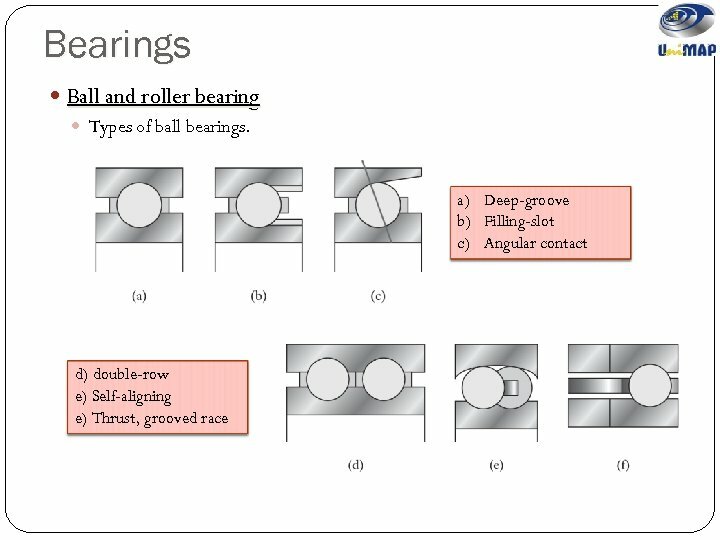 The term thrust bearing is used for bearings that are designed to withstand forces along the axis of a shaft when the relative motion is primarily rotation. 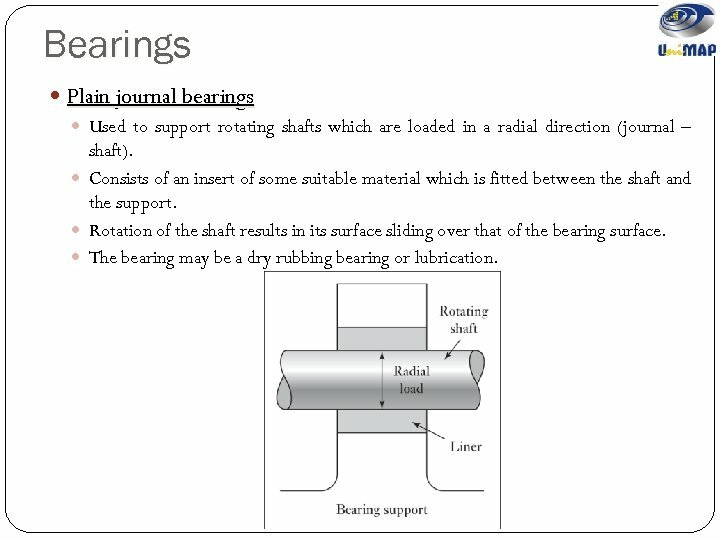 Bearings Plain journal bearings Used to support rotating shafts which are loaded in a radial direction (journal – shaft). Consists of an insert of some suitable material which is fitted between the shaft and the support. Rotation of the shaft results in its surface sliding over that of the bearing surface. The bearing may be a dry rubbing bearing or lubrication. Bearings Ball and roller bearing With this type of bearing, the main load is transferred from the rotating shaft to its support by rolling contact rather than sliding contact. 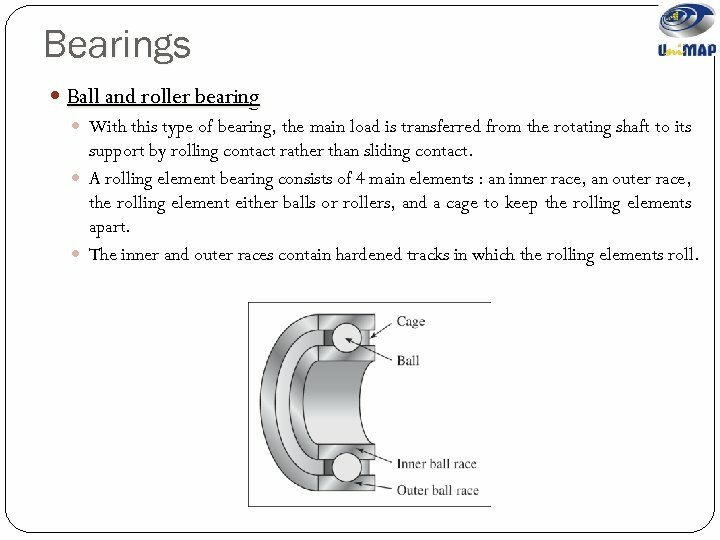 A rolling element bearing consists of 4 main elements : an inner race, an outer race, the rolling element either balls or rollers, and a cage to keep the rolling elements apart. The inner and outer races contain hardened tracks in which the rolling elements roll.